A Nature Conservancy representative points out portions of the newly purchased land. Nature Conservancy buys 117,000 acres Of Plum Creek land in Montana. Chris Bryant, a land protection specialist with the Montana Chapter of the Nature Conservancy, says his group’s ownership is only temporary, and the long-term goal is conservation. “In the past we’ve sold the land to public agencies. Sometimes private neighbors will buy it and expand their operations with conservation easements on it." Bryant says this is the last piece of Plum Creek owned land in the area, and that all of the land will open to recreationists, hikers and hunters. Which is good news for local business owners. Bryant says feedback from the area so far has been good. Addrien Marx, owner of two Conoco stations in Seeley Lake and a Montana Wilderness Association council member says she’s thrilled. The Nature Conservancy has purchased land inside the Crown of the Continent before: More than 300,000 thousand acres in 2008. 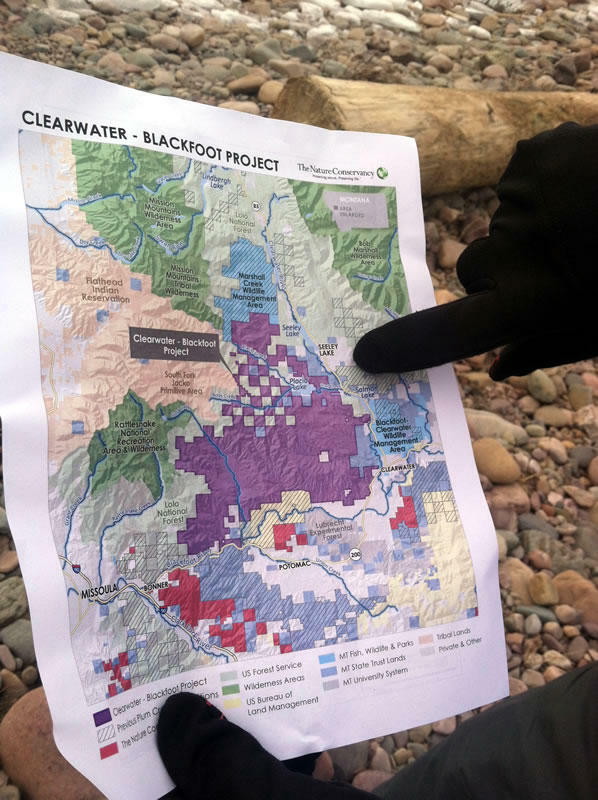 Today’s purchase is part the group’s Clearwater-Blackfoot Project which they say is vital to preserve wildlife, forests, and water in this area. Now that the watershed has only one owner, it eliminates that checkerboard pattern you might see on a state forest service map. In some parts of Montana, landowners can change three times in three miles, and the Nature Conservancy’s Bryant says those checkerboards are often a land management hassle. For example, different landowners can have different priorities for roads. 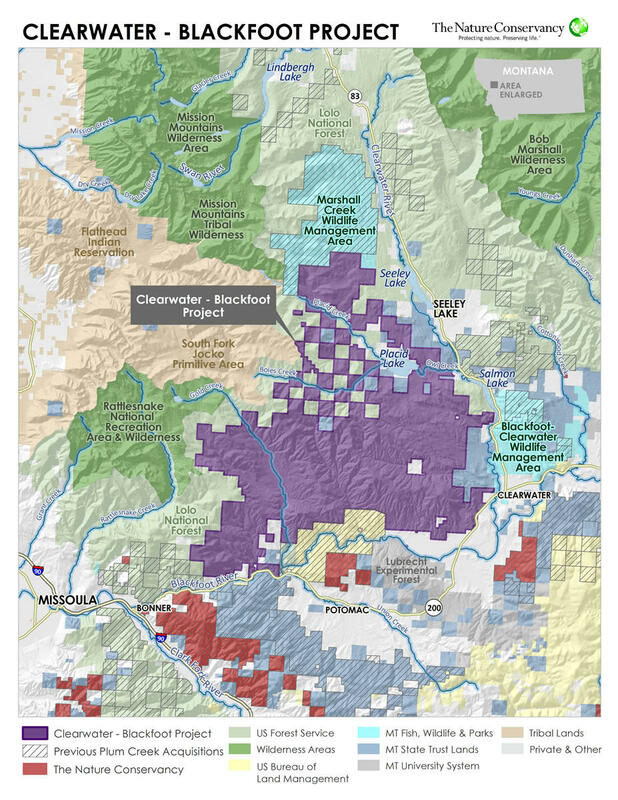 The purchase is part of the Conservancy’s $134 million, two-state Great Western Checkerboards Project, which they say will preserve recreational access and the ecosystem across more than 250 square miles in Montana and the Cascade Mountains of Washington. The U.S House has approved a $585 billion defense bill that includes unrelated provisions to expand wilderness areas. The vote was 300 to 119. The measure allows President Obama to expand America's military mission against Islamic militants in Iraq and Syria. It now moves to the Senate where some Republicans object to the unrelated wilderness measures announced yesterday. Montana's congressional delegation heralded the suite of included land bills as a historic, rare display of collaboration and Congressional bipartisanship. Some Montana environmental groups agree. Montana's Senators and Senator-elect today announced what they're calling a “landmark” package of public lands legislation. It's being tacked on to a Defense authorization bill that the House and Senate are expected to vote on this week and next. One of Montana’s foremost voices on wilderness issues is Doug Peacock. He’s a decorated Vietnam veteran who says the time he spent in wilderness helped him recover from the psychological trauma he suffered in combat. Peacock continues to work with groups that bring a new generation of combat vets into wild places.